Before we go too far down the road cheering the forces of Iranian democracy, let's not forget that its public face, Mir-Hossein Mousavi, has American blood on his hands. He was Iran's Prime Minister during most of the 1980s, a time when the country was waging a terrorist campaign against the U.S. Earlier this week, I received an e-mail from a Lebanese who was present at the creation of the country's Iranian-backed, Shi'ite militia Hizballah in 1982 and on familiar terms with its most radical and violent members. He wrote: "Are you people crazy backing Mousavi, a patron of Hizballah's terrorist wing?" Indeed, Mousavi, Prime Minister from 1981 to 1989, almost certainly had a hand in the planning of the Iranian-backed truck-bombing attacks on the U.S. embassy in April 1983 and the Marine barracks in October of that same year. Mousavi, as my Lebanese contact reminded me, dealt directly with Imad Mughniyah, the man largely held responsible for both attacks. (Mughniyah was assassinated in Damascus last year.) The Lebanese said Mughniyah had told him over and over that he, Mughniyah, got along well with Mousavi and trusted him completely. When Mousavi was Prime Minister, he oversaw an office that ran operatives abroad, from Lebanon to Kuwait to Iraq. This was the heyday of Khomeini's theocratic vision, when Iran thought it really could export its revolution across the Middle East, providing money and arms to anyone who claimed he could upend the old order. Mousavi was not only swept up into this delusion but also actively pursued it. 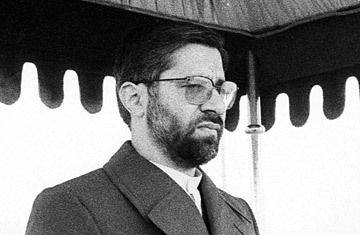 It was Mousavi who appointed Iran's ambassador to Damascus, Ali Akbar Mohtashemi-pur, the Iranian caught red-handed planning the Marine-barracks bombing. Mohtashemi-pur also coordinated the hostage-taking in Lebanon. As a reward, Mousavi gave him the Interior Ministry, where Mohtashemi-pur went on to crack down on what was left of democracy in Iran. And it is not as if Mousavi kept his support for Iran's secret war on the U.S. a secret. In a 1981 interview, he had this to say about the taking of American diplomats in Tehran in 1979: "It was the beginning of the second stage of our revolution. It was after that we discovered our true Islamic identity." None of this is to exonerate the other candidates. Mahmoud Ahmadinejad was an officer in the Islamic Revolutionary Guards Corps, the Iranian paramilitary force responsible for most of the terrorism against the U.S. Conservative Mohsen Rezaei was the Guards' commander. And Mehdi Karroubi, like Mousavi, was deeply involved in Lebanon in the '80s. According to my Hizballah contact, he too was a patron of Mughniyah's. This may all be ancient history to Iran's fledgling democratic movement, and history the Op-Ed pages of our newspapers would prefer to forget. But at the very least, it should be a reminder that, when it comes to political leaders, there are no good choices in Iran. It is a promising sign that Mousavi has put his violent past behind him, as has Iran for the most part, but let's not completely forget his far-from-democratic roots. See pictures of Iran's elections and their turbulent aftermath.